It’s Throwback Thursday so let’s go back through Upper Deck’s trading card history and come up with a fun giveaway. As you may have seen in our previous post below, Upper Deck employees had a day of fun yesterday with a visit from the Stanley Cup. It didn’t matter which team you rooted for when posing for a picture, its The Cup– everyone wants a picture! 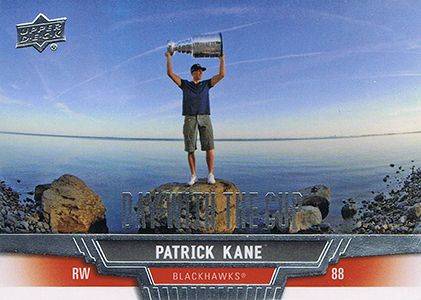 Needless to say, everyone was happy with their “Day with The Cup”, so let’s put up a throwback card and see if our fans can come up with some great captions for this Day with The Cup card of Patrick Kane of the Chicago Blackhawks! Please share your comical caption to this card for your opportunity to score a 5×7 Keepers of The Cup card signed by Phil Pritchard! 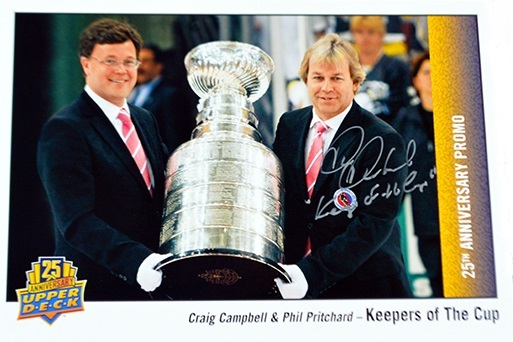 Leave a caption for your opportunity to score this 5×7 Keepers of The Cup card signed by Phil Pritchard! You have until Friday morning, October 17th at 8:00 a.m. PT to post your caption before this promotion is closed. I’m the king of the world!!! Heaviest can of spaghetti sauce…. ever! I went to the ends of the earth for this cup , what would you do ? Man! How am I gonna get home! Look what I caught! Is it over the minimum? Can I keep it? Mom! Snap the picture already! I am the king of the land and sea! Hey Kane…can I have a CUP of water? They said winning the cup ROCKS, well apparently it does. Ahh, these shoes really don’t match anything! I just hope to keep my balance! look up in the sky its that puck tracking thing. Hey Coach, sorry for the giveaway, how much longer do I need to hold this over my head? Check out my new bobber for fishing. Mr Miyagi, I really don’t see how this will make me a better hockey player. Just let Craig & Phil try to take it from me! Congrats to Turk for being selected to SCORE from this week’s Create the Caption promotion! Thank you to everyone for participating and we look forward to seeing your comments again real soon.